Udhagamandalam , the capital of Nilgiri district, is popularly known as the "Queen of hill stations' among the tourist circuits. It is situated at a distance of 105 km away from Coimbatore. The height of the hills in the Nilgiri range varies between 2280 and 2290 metres, the highest peak being Doddabetta at a height of 2623 metres. 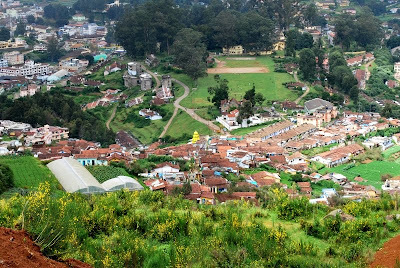 It is believed that the name Nila, has been in use for over 800 years since, the King of the Hoysalas Vishnu Vardhana, who ruled from 1104 to 1141 AD seized the Nilgiris Plateau. His general Ponisia recorded this fact in 1117 AD with mention of Todas. The name Nilgiri was due to the blue haze, which envelops the range with most distant hills of considerable size. The establishment of numerous tea estates made Ooty famous. Lofty mountains, dense forest, sprawling grasslands and miles and miles of tea gardens greet the passengers on most routes. The annual Tea and Tourism Festival attracts crowds in huge numbers. Visit Ooty during this festival, when tea lovers from all over the world converge. An occasion not to be missed!